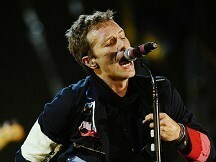 Coldplay are to play a string of UK stadium shows next year. The gigs at major football grounds follow the band's short series of arena gigs which take place next month. The band, who launched chart-topping album Mylo Xyloto with a show at a major bull ring in Madrid last month, will kick off the dates at Coventry's Ricoh Stadium on May 29. They then head to London's Emirates Stadium (June 1 and 2), Sunderland's Stadium of Light (7) and Manchester's Etihad Stadium (9). Tickets will go on sale from 9am next Friday, November 18. Pop star Peter Andre officially got the festive season under way as he switched on the Christmas lights. Heavy metal pioneers Black Sabbath are to record their first new album with the original line-up for 33 years. Coldplay are to play a string of UK stadium shows next year.The gigs at major football grounds follow the band's short series of arena gigs which take place next month. Thrash metal band Metallica will perform their best-selling "Black" album in its entirety at next year's Download festival at Donington Park.